Touchpoint Plus 19" rack is an easily configurable, rack control system that supports up to eight channels of gas detection with a further eight channels available through an optional 19" rack expansion unit. It accepts inputs from 2 or 3-wire mA or mV field devices. Its intuitive, multilingual interface simplifies operation and reduces training requirements. The full colour traffic light style status indication provides clarity from a distance. Touchpoint Plus 19" rack includes a comprehensive set of outputs as standard including common alarms and dedicated drives for remote audiovisual indicators. 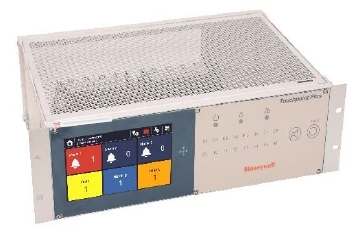 Standard Supply: Touchpoint Plus 19" rack controller is supplied complete with pre-assembled I/O moduels, 7" colour LCD, and 19" rack housing. The optional expansion 19" rack expansion unit holds the same modules as the Touchpoint Plus 19" rack controller, but has no controller or user interface. The main module can accept power in and CAN connection only. The Touchpoint Plus 19" rack controller and the 19" rack exapansion unit support up to 16 channels of gas detections. TPPLRC-V4NN	TPPL 19" Rack controller supplied completed with 4xmV Master 2 and Master Fault. TPPLRC-A4NN	TPPL 19" Rack controller supplied completed with 4xmA inputs, including Master 1, Master 2 and Master Fault. TPPLRC-D4NN	TPPL 19" Rack controller supplied completed with Master 1, Master 2 and Master Fault. TPPLRC-V4SN	TPPL 19" Rack controller supplied completed with 4xmV inputs, 12 programmable relays. TPPLRC-A4SN	TPPL 19" Rack controller supplied completed with 4xmA inputs, 12 programmable relays. TPPLRC-D4SN	TPPL 19" Rack controller supplied completed with 2xmA and 2xmV inputs, 12 programmable relays. TPPLRC-V4S4	TPPL 19" Rack controller supplied completed with 4xmV relays, and with 4x repeated mA outputs. TPPLRC-A4S4	TPPL 19" Rack controller supplied completed with 4xmA inputs, 12 programmable relays, and with 4x repeated mA outputs. TPPLRC-D4S4	TPPL 19" Rack controller supplied completed with 2xmA and 2xmV inputs, 12 programmable relays, and with 4x repeated mA outputs. TPPLRC-V8NN	TPPL 19" Rack controller supplied completed with 8xmV Master 2 and Master Fault. TPPLRC-A8NN	TPPL 19" Rack controller supplied completed with 8xmA inputs, including Master 1, Master 2 and Master Fault. TPPLRC-D8NN	TPPL 19" Rack controller supplied completed with 4xmA and 4xmV inputs, including Master 1, Master 2 and Master Fault. TPPLRC-V8SN	TPPL 19" Rack controller supplied completed with 8xmV relays. TPPLRC-A8SN	TPPL 19" Rack controller supplied completed with 8xmA inputs, 12 programmable relays. TPPLRC-D8SN	TPPL 19" Rack controller supplied completed with 4xmA and 4xmV inputs, 12 programmable relays. TPPLRC-V8DN	TPPL 19" Rack controller supplied completed with 8xmV relays. TPPLRC-A8DN	TPPL 19" Rack controller supplied completed with 8xmA inputs, 24 programmable relays. TPPLRC-D8DN	TPPL 19" Rack controller supplied completed with 4xmA and 4xmV inputs, 24 programmable relays. TPPLRC-V8D8	TPPL 19" Rack controller supplied completed with 8xmV relays, and with 8x repeated mA outputs. TPPLRC-A8D8	TPPL 19" Rack controller supplied completed with 8xmA inputs, 24 programmable relays, and with 8x repeated mA outputs. TPPLRC-D8D8	TPPL 19" Rack controller supplied completed with 4xmA and 4xmV inputs, 24 programmable relays, and with 8x repeated mA outputs. TPPLRE-V4SN	TPPL 19" Rack expansion unit supplied completed with 4xmV programmable relays. TPPLRE-A4SN	TPPL 19" Rack expansion unit supplied completed with 4xmA inputs, 12 programmable relays. TPPLRE-D4SN	TPPL 19" Rack expansion unit supplied completed with 2xmA and 2xmV inputs, 12 programmable relays. TPPLRE-V4S4	TPPL 19" Rack expansion unit supplied completed with 4xmV programmable relays, and with 4x repeated mA outputs. TPPLRE-A4S4	TPPL 19" Rack expansion unit supplied completed with 4xmA inputs, 12 programmable relays, and with 4x repeated mA outputs. TPPLRE-D4S4	TPPL 19" Rack expansion unit supplied completed with 2xmA and 2xmV inputs, 12 programmable relays, and with 4x repeated mA outputs. TPPLRE-V8NN	TPPL 19" Rack expansion unit supplied completed with 8xmV Master 1, Master 2 and Master Fault. TPPLRE-A8NN	TPPL 19" Rack expansion unit supplied completed with 8xmA inputs, including Master 1, Master 2 and Master Fault. TPPLRE-D8NN	TPPL 19" Rack expansion unit supplied completed with 4xmA and 4xmV inputs, including Master 1, Master 2 and Master Fault. TPPLRE-V8SN	TPPL 19" Rack expansion unit supplied completed with 8xmV programmable relays. TPPLRE-A8SN	TPPL 19" Rack expansion unit supplied completed with 8xmA inputs, 12 programmable relays. TPPLRE-D8SN	TPPL 19" Rack expansion unit supplied completed with 4xmA and 4xmV inputs, 12 programmable relays. TPPLRE-V8DN	TPPL 19" Rack expansion unit supplied completed with 8xmV programmable relays. TPPLRE-A8DN	TPPL 19" Rack expansion unit supplied completed with 8xmA inputs, 24 programmable relays. TPPLRE-D8DN	TPPL 19" Rack expansion unit supplied completed with 4xmA and 4xmV inputs, 24 programmable relays. TPPLRE-V8D8	TPPL 19" Rack expansion unit supplied completed with 8xmV programmable relays, and with 8x repeated mA outputs. TPPLRE-A8D8	TPPL 19" Rack expansion unit supplied completed with 8xmA inputs, 24 programmable relays, and with 8x repeated mA outputs. TPPLRE-D8D8	TPPL 19" Rack expansion unit supplied completed with 4xmA and 4xmV inputs, 24 programmable relays, and with 8x repeated mA outputs.